Peasant Tunic for Genesis 2 Male for use in Daz Studio 4.8. Morphs for lengthen and shorten skirt included. Movement handles included. Thank you for this amazing work ! I really do like to make clothes for the stickman. Thanks Wendy for redoing & updating this outfit. There is a lenghten/shorten morph which may help. Thank you very much deary! If I may inquire, can I shorten the skirt? I have pants that may clip...! Many thanks to you for this. I have completely redone the files for this item and uploaded a new file. 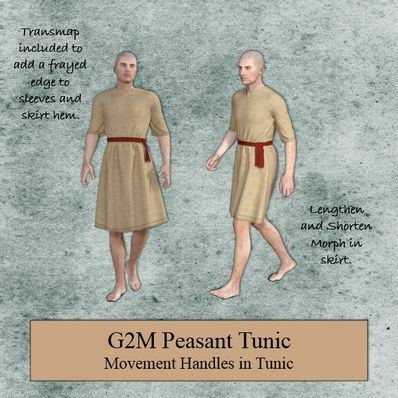 Please uninstall the originall tunic before installing the new one. Thank you. Thanks marcoio for letting me know. thank you so much, it will be very useful . Simply the perfect Roman and medieval tunic. Thank you very much! This looks great! Thank you so much for continuing to support Genesis 2 figures! this is very nice and can be used for many different scenarios over different eras. Thanks so much! Just what I need. Thank you very much.